sizes and lots of great colors. certain you were exactly consistent with the right pressure down the leg? Yes, there is a better way. 1| Plastic baggie over foot. 1 | Consistent correct pressure. 2 | Removes human error with wrapping. 3 | Hassle-free, saves valuable time. Equiflexsleeve, a proprietary blend of multi-tensioned fibers infused with antimicrobial technology, acts as a compression sleeve/therapeutic joint support for horses. Reduces stocking up and provides support for an injured leg and its load-bearing opposite. Created in early 2009, Equiflexsleeve was developed to treat the inventor’s own horse’s degenerative suspensory ligament lameness. The goal was to develop a product that would provide the support of a traditional standing wraps without any of the negative side effects associated with their long-term use. With the help of physicians and equine veterinarians, Equiflexsleeve was developed to meet this need. To read more about the start of Equiflexsleeve and how they were developed, visit our about page for the full story. Because Equiflexsleeve has no adjustable straps or fasteners, the element of human error in application is removed. 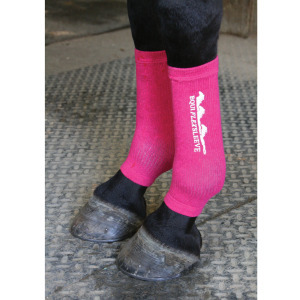 Equiflexsleeve provides optimal equine leg support for your horse’s legs, and everyone finds them easy to use. Equestrians – Want your own Equiflexsleeves, the revolution in equine leg support? Shop online right here on the Equiflexsleeve website today! Veterinarians/Equine Medical and Rehab Facilities – Find out how we can work together to meet your patients’ needs. Contact founder/inventor Mary at info@flexsleeve.com today! If you have any questions, comments, or feedback, please contact us. We’d love to hear from you. Equiflexsleeve now sells directly from our website to you!